Hello, I’m new around here, and I’m going to try this sketch challenge. I hope to improve myself and hopefully learn new techniques. I’m going to take the Exploding Barrel as my base effect. Exploding barrels can exist in tons of video games in so many different forms (Sci-fi, fantasy, heck, even regular barrel…), so I have a lot of choices ahead of me. I’m going to try to emulate Breath of the Wild’s stylized effects as much as I can while trying to focus on the concept/shape of my effects, since colors are out of the equation in this challenge. Posting here an imgur album with references, because as a Novice, I’m not sure I’m allowed to post multiple pictures in one post. Edit : Here are the first sketches, I hope to post the last 3 asap. Just a regular wood barrel. OR IS IT? My favorite TvTrope. Inspired by the skill Horror of the Witchdoctor from Diablo. Thanks for the idea @Lush ! Thank you too for your great ref collection, @simonschreibt , It’s gonna be really usefull soon! I think I’ll have more time next week to start making the actual FXs. Hopefully. Anyway, thanks for reading this post. Waiting for you to post your next update. 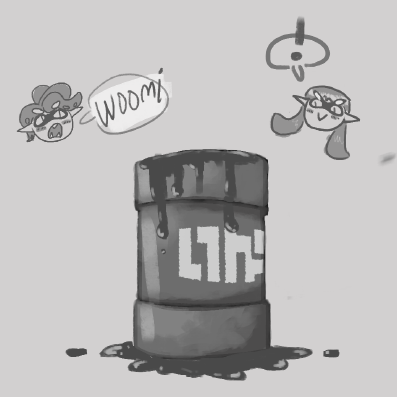 Here’s an idea: make a Splatoon inspired barrel explosion with loads of paint coming out of it! And yes, you’re allowed to post multiple pictures in one post, but the imgur album is also a nice solution. Thanks for the idea, @Lush , an effect inspired by splatoon soons really cool. Hopefully I can post the last 3 effects on my main post tomorrow.